The Code of Understanding App! For only € 3,49 including VAT, you can download this unique app which makes all other expensive assessments superfluous. 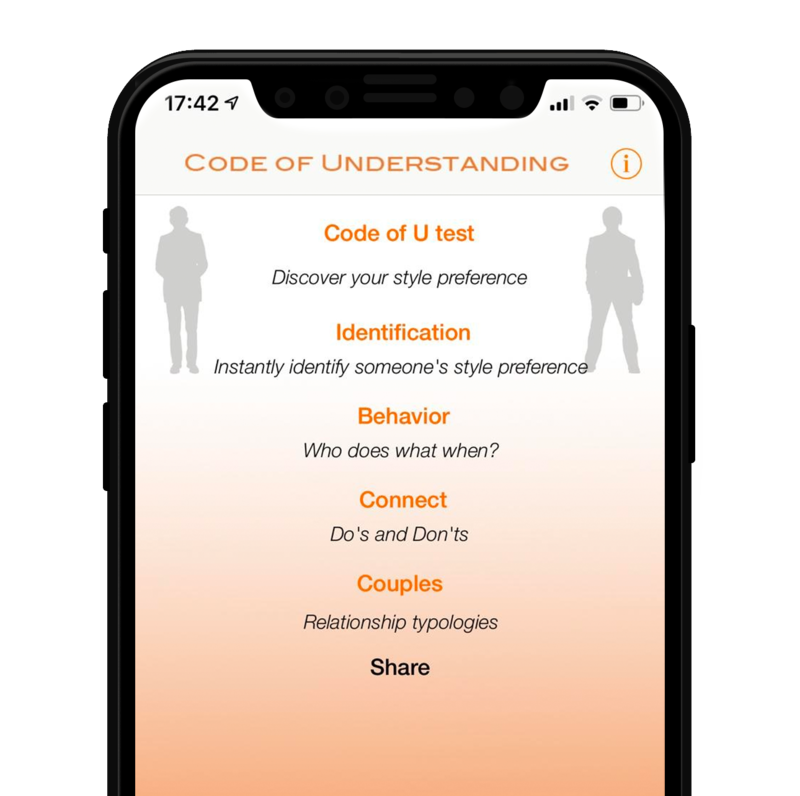 The Code of Understanding App gives you clear insight into your own communication moods and behavioral preferences and that of the people around you. The app contains a questionnaire of which the results tell you about your own communication moods and behavior. It explains what that means in relation to yourself and others. You can also ask people around you to fill in the questionnaire and save the results to refer back to at any time in your relationship or compare your results. The app is a practical and easily accessible guide with clear descriptions of different communication preferences, comprehensive behavior descriptions. It gives many easy-to-use-tips on how to improve relationships instantly through a recognition module and even a special section with insights and advice for couples. You could also give the App as a gift! More than 500 (!) tips to effectively collaborate and communicate with others, anytime and anywhere. The Code of Understanding App is trilingual: Dutch, English, and German. You can change languages in the app. we’re all about making people successful!